You know something is really, really good when it is made in 50 gallon and 80 gallon containers due to the enormous quantities needed to supply the demand. Such is the case with The Tides Wharf & Restaurant’s famous New England Style Clam Chowder. To experience this Bodega Bay tradition first hand, be sure to plan a trip to Bodega Bay, California this season. In the meantime, Carlo Galazzo, General Manager of The Inn at The Tides and Tides Wharf & Restaurant was kind enough to give us The Tides Wharf & Restaurant’s coveted Clam Chowder Recipe for CALIFORNIA LIVING™ viewers and web visitors to try at home. 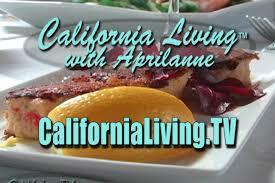 CALIFORNIA LIVING® with host Aprilanne Hurley reaches millions of TV households in the San Francisco, Oakland and San Jose Calif. Market – the Nation’s 6 largest TV market. Currently airing on Ion Television in both the San Francisco and Sacramento markets – CALIFORNIA LIVING® is thrilled to be celebrating over 10 years on broadcast television with the ongoing mission to deliver fun, “California lifestyle” centric content in a fun paced, TV magazine style format. Love everything about the California food & wine scene? Score food & wine pairing secrets from pros like Napa Valley’s Culinary Institute of America’s Executive Chef John Ash FREE – and take your entertaining prowess to new heights – instantly…with the CALIFORNIA LIVING® TV Summer 2014 Food & Wine Pairing Series featuring a star-studded line-up of coveted interviews with sensational executive chefs from renown California restaurants in famous food & wine destinations such as Napa Valley, Sonoma County and the California Coast.